If you're thinking about what is the best arena for your cat, TK-Pet gives you the option to always, but improved. 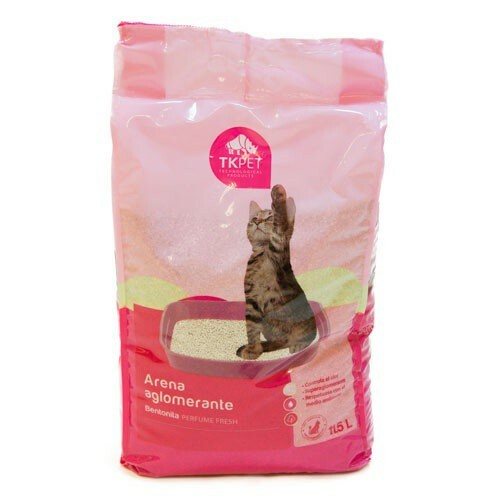 Its new range of arenas for felines has excellent quality dust free. It is made from bentonite, natural material origin and sensitized with the environment. The best attribute of this product for cats is undoubtedly its high absorbent capacity; also it causes small clusters easy to remove with a shovel. By forming clumps prevents the sand from getting wet and penetrate your cat urine. The odor control is foolproof and that will help to maintain good hygiene of your home. The most favored with the election of this article is your pet cat, as the soft touch does not damage their hooves and is easy to tread. As loose powder, will not cause discomfort to your cat nor harm the welfare of the bed. The TK-Pet brand specializes in pet products. Always use the best quality materials at very competitive prices average economy. Sold exclusively in Tiendanimal. One of the best in value for money. Bed cat litter bentonite, natural and free of dust. High absorbent and perfume fresh. Controls odors and favors household hygiene. No loose dust and dirt no scatters. Scented cat litter bentonite with a soft perfume fresh. Placed in the drawer cat a layer of sand of about 7 cm and renew it when necessary. Cleans agglomerations are accumulated daily. When cleaning the drawer rid of waste together with household waste. With gentle perfume fresh this sand dust will not lift one of your best allies for your cat and home.